India has ranked 59th in the Rule of law index 2015 compiled by The World Justice Project gaining an overall score of 0.51 out of 1. Rule of law index measures adherence to the rule of law by looking at policy outcomes such as whether people have access to courts or whether crime is effectively controlled. The top five countries with highest score are Denmark, Norway, Sweden, Finland and Netherlands and the bottom five countries are Pakistan, Cambodia, Zimbabwe, Afghanistan and Venezuela. 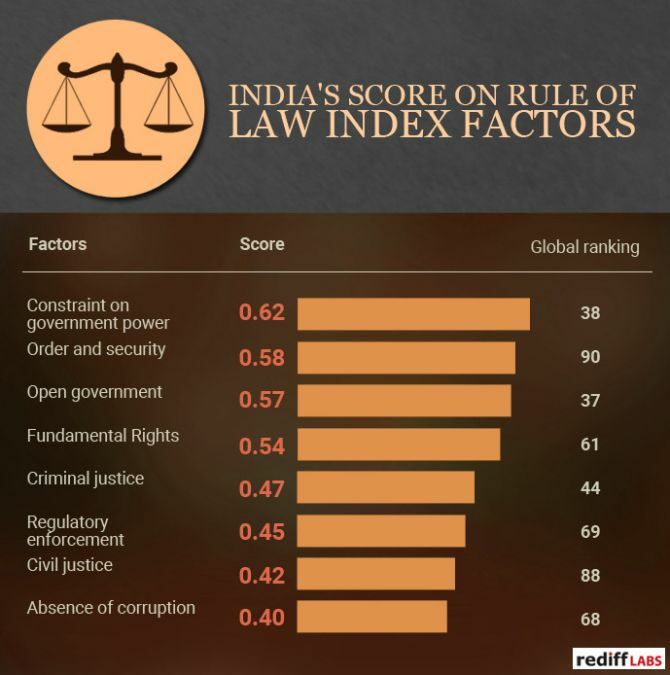 The infographic below shows how India has scored in the eight factors considered to calculate the Rule of law index 2015. The World Justice Project has released the Rule of Index 2015 report for 103 countries and ranked each country according to their scores from eight factors. Constraint on government powers: It measures the effectiveness of the institutional checks on government power by the legislature, the judiciary, and independent auditing and review agencies, as well as the effectiveness of non-governmental oversight by the media and civil society, which serve an important role in monitoring government actions and holding officials accountable. Open government: It measures whether basic laws and information in legal rights are publicised, and assesses the quality of information published by the government. It also measures whether requests for information held by a government agency are properly granted. Fundamental Rights: It measures the protection of fundamental human rights, including effective enforcement of laws that ensure equal protection, the right to life and security of the person, due process of law and the rights of the accused, freedom of opinion and expression, freedom of belief and religion, the right to privacy, freedom of assembly and association, and fundamental labour rights, including the right to collective bargaining, the prohibition of forced and child labour, and the elimination of discrimination. Order and security: It measures various threats to order and security including conventional crime, political violence, and violence as a means to redress personal grievances. Regulatory Enforcement: It measures the extent to which regulations are effectively implemented and enforced without improper influence by public officials or private interests. It also includes whether administrative proceedings are conducted in a timely manner without unreasonable delays and whether due process is respected in administrative proceedings. Civil justice: It measures whether civil justice systems are accessible and affordable, free of discrimination, corruption, and improper influence by public officials. It examines whether court proceedings are conducted without unreasonable delays, and if decisions are enforced effectively. Criminal Justice: It measures whether the criminal investigation, adjudication, and correctional systems are effective, and whether the criminal justice system is impartial, free of corruption, free of improper influence, and protective of due process and the rights of the accused.